A few weeks ago, I wrote about my dissatisfaction with the King of Limbs - it just seems like a rootless idea of an album rather than anything of lasting quality. As Rino astutely commented at the time, it sounded more like "a Thom solo work" than a fully fledged Radiohead album. The Supercollider/The Butcher ep was released to coincide with Record Store Day and was then subsequently available as a free download to anyone who had bought Limbs. I've spent a week with these songs (so as not to rush to judgment) and actually like them better than anything on that record. They'd certainly sound more at home on Eraser than on In Rainbows but I think they instinctively feel more Radioheady. Supercollider is a seven minute song cycle that is meditative and languid with no obvious chorus and is probably the closest Radiohead will get to trance music. Of note, Thom Yorke's voice is beautiful in this song and swells and ebbs with the orchestration that surrounds the repetitive beats that underpin the song. The song feels much more dynamic than the material on Limbs and after a few listens starts seeping into your brain. I think this might be a perfect of example of the sound the band were going for on the album but failed to reach - late night headphones and a glass of wine headfuck music. The obvious problem with this song is that one thing Radiohead do very well is tracking their albums and I fail to see how a seven minute trance song would have fit into the short and sweet aesthetic of The King of Limbs. However, with a bit of embellishment on the other tracks and a different track order this could have easily been the centrepiece of that album. The Butcher, on the other hand, is much more immediate than Supercollider. With a tribal drum pattern that is as ominous as the dark discordant bass keys that propel the tune, it fights for your attention and has all the threat and doom of classic Radiohead. Again, Yorke's singing is top notch and while the content is as obtuse as ever, again, this song feels much more complete and enjoyable than anything on the recent record. It's not unknown that Radiohead release strong b-sides but releasing an ep a few weeks after the main album with songs that seem infinitely stronger is definitely some of the weirdest, backward arsed promotion I've ever come across. Maybe these songs would seem out of place or weaker if they'd been included on the album itself but the demise of Radiohead as a purveyor of quality tunes might have been grossly exaggerated based on the evidence here. Update: my crack at a new track listing can be found here. Agreed - I'm going to have to re-burn a disc of Limbs with these two tracks attached. With Twisted Words too. I think with these at the end they'll continue the upward quality-arc of the album. Let's mix and see. I think I'll do the same as Rino. These ones feel great. 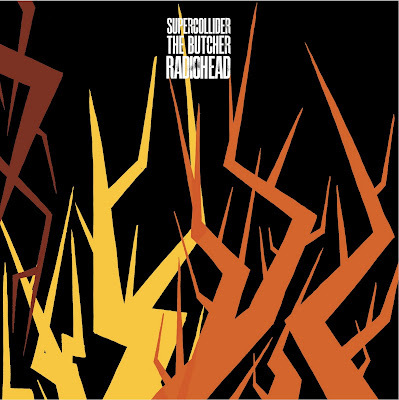 "FYI... 'The Butcher' was recorded and mixed during 'The King of Limbs' sessions, but we couldn't make it work on the album; 'Supercollider' was started during those sessions and finished off in March of this year." I believe they're just starting a new era of new sounds... Maybe TKOL is another Pablo Honey! The new Pablo Honey - I like that theory Kelton. I have a vague memory of them talking about releasing music in a less traditional format so maybe this is the beginning of a whole slew of quality eps - either way I think both these songs are great. I'm on the road at the moment but when I get home I'm going to start playing with different track listings for this album. The Wash Up: Record Store Day is today! Where the hell is Bowie?